Another image I culled from the hundreds of images I personally captured with my lens on 1/17/2009. This was taken at the Wilmington Delaware Train Station, during the historic Whistle Stop Tour that passed through there. 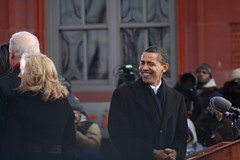 Here, President elect Barack Obama turns towards the direction of Vice President elect Joe Biden and his wife Jill. In this instant, each shares a little piece of the spotlight. You can click directly on this image to see it in a much larger size and topped off on a black background. You can click on the ImageKind button right below this , to browse my gallery.